The MSP 501 Awards Dinner at Channel Partners Evolution was packed with companies recognized in Channel Futures' worldwide rankings. CHANNEL PARTNERS EVOLUTION — The inaugural MSP 501 Awards Dinner Wednesday night toasted the best of the best in MSPs from around the world. The event was jam-packed with companies on the 2018 Channel Futures MSP 501 ranking of the top MSPs globally. Datto and Ingram Micro were the premier sponsors of the event at Channel Partners Evolution. Livetime Achievement Award — David Eisner, Dataprise‘s CEO. 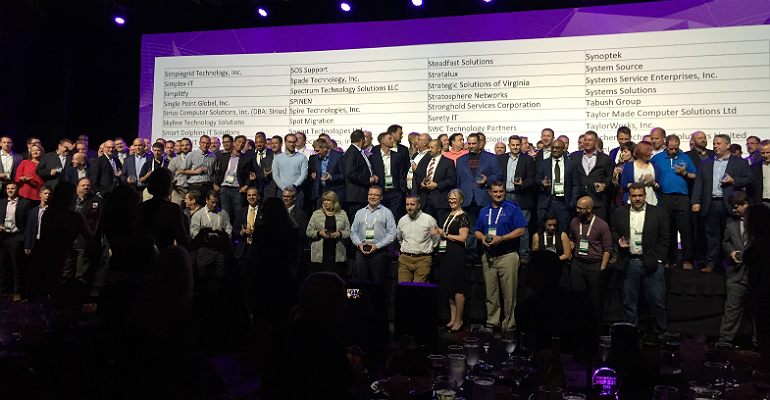 The MSP 501 winners were chosen based upon self-reported financial information such as annual revenue, recurring revenue, growth in supported devices and users, and growth in staff size, among many others. The event drew more than 100 MSPs of various rankings on the list. James Nekos, Edge Technology Group‘s CEO, said his company rose nine slots on the latest 501 ranking. Jim Mullen, vice president of sales at All Covered, Konica Minolta’s managed services business, said his company has ranked on the MSP 501 list for eight years. The picture used was taken as everyone was still getting in place, update that when you can to include everyone.